Nice to see a limited edition of the game with a physical copy. where do i pre order it? I've already tried to search for the Limited Edition in North American stores, but I guess it's not available (yet?). I know a guy from the USA who wants to have the Limited Edition for PS4, he decided to purchase it here. But I guess you want the PC version? YesAsia offers delivery to the USA & Canada, but the offer looks kinda suspicious and the release date is set to 31.03 (?!). If it was OK for you to buy the game in Europe, you'd have a lot of options (e.g. Amazon). Alternatively, you can try to win it in GreenManGaming's contest. Are you doing a press spokesperson for gloomywood or what? how come you're always so well-informed about these things. Good. I want the voxel editor as well, is it for limited edition/beta acess users only? I ordered a regular download. Yup, it only for those who participated in the crowdfunding campaign on Ulule. That's right. There are two release dates: March 10th for the digital version and March 17th for the physical Collector's Edition. Looks like a GOG release is out of the question due to publisher & DRM policies they have, even though this was pretty much promised during the crowdfunding stage. 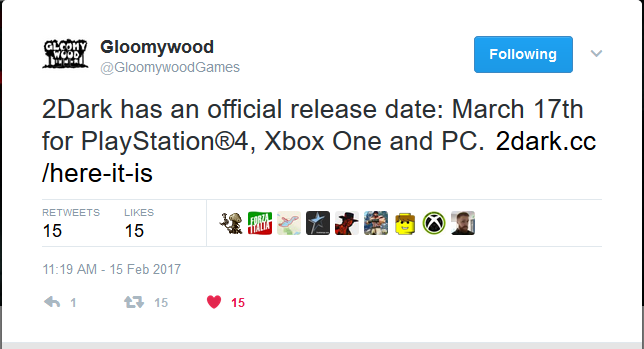 This also most likely means there will be no release for any other OS than Windows. Unfortunate turn of events. It's not a big deal for me but I can imagine there are some pissed backers out there. Personally I'm looking forward to this release a lot regardless, what I experienced in the beta was lovely and I'm sure that charm will be present in the full game. Looks like a GOG release is out of the question due to publisher & DRM policies they have, even though this was pretty much promised during the crowdfunding stage. Yeah. Sadly, that's the price of having a publisher. It's not a big deal for me but I can imagine there are some pissed backers out there. There are indeed. It's enough to take a look at Reddit or 2Dark Steam forum. Actually I want the PS4 version. But I'm waiting to get in in North America. Will cost less for sure. I did. Does it depend on ammount of money donated? If you participated in the Ulule campain, it's very likely that you have already received a Steam key for 2Dark, so check your mailboxes. Not downloadable yet, but activable nonetheless. Yep, it's on my mail box. Thanks for the heads up. Btw. I love their effort and attention to putting on a good soundtrack to the game. I've seen a video of the orchestra recording it at a beautiful studio and that made me smile, I just love seeing the backstage of things. So the game is out. Anyone started playing it yet? I played a bit of the very first level with children before work this morning. Thus far I'm loving it. I bought it on Steam but haven't started playing yet. Just finished the first level. So far it's a good game, maybe a bit weird to get used to the controls. The added risk of having the kids with you really makes the experience more intense. I completed two levels. Second level with fat lady and her dolls is awesome much better than first. Also soundtrack is great.